Here's a layout I made for Chic Tags, it's another one where I mixed and matched papers, tags and stickers from different collections. My layout started with the cute "cookies & milk" card, since the photo is of Gracie making her favorite slice and bake cookies, I just had to use it! It originally said "cookies for Santa" on there too, but I cut that part off to make it my own ;) I used my Silhouette die cutting machine to cut the circle mat cut file, then cut the wood grain paper (the notebook paper is on the backside) to add behind the circles. For more color, the teal cardstock was added to match the cookies & milk card. I added a few buttons here and there to bring out the pops of red in the stickers, and my layout was complete! This is just adorable! 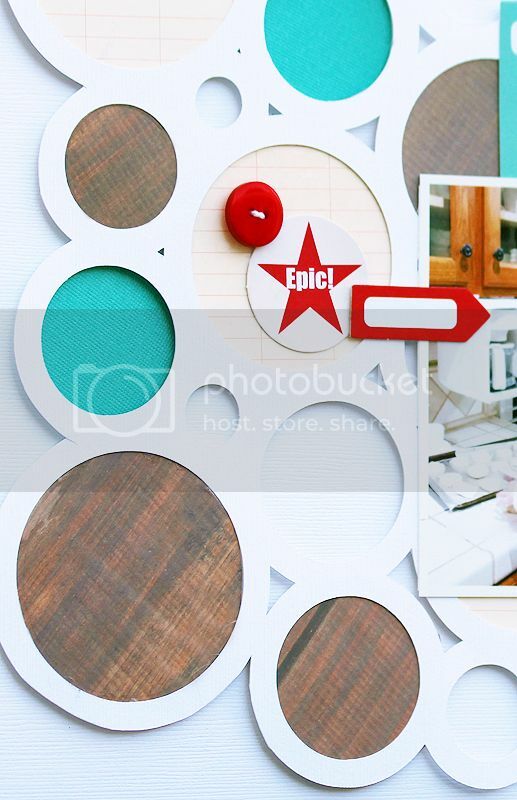 Love the woodgrain filling the circles!! !